Those past years got me thinking a lot about what away means. I took to dictionaries. There was a wealth of meanings and usages. I remembered an old lady who used to live in my mother’s neighbourhood. She had a lovely little pet companion, a dachshund by the name of Wastel. And one day he was no more. She never said he had died, she’d always say he had gone away. Awayness comes in various kinds. Some awayness we choose, others we are forced into. Some awayness is temporary, others will be permanent. Some awayness feels like alleviation, others hurt. Some awayness we hardly notice, others might be life changing. And there are people who see their homes flooded – this need not be the monsoon, it can be torrential rain in the Lake District. Or shaken to rubble by earthquakes, be it in Japan or Italy. Or burnt to embers by wild fires, be it in Australia or the Spain. Or blown to pieces by tornados in the US. Or washed to the sea as in Norfolk. These are but some of the many shapes and diguises in which we might encounter awayness. The news tell us of the catastrophy, or the war, the bombing or the accident. The news do not tell that people lost all their family photos, their favorite soft toy, the violin their granddad used to play. It might be small things, but nevertheless they cannot be replaced or rebuilt. Once the are lost they are away for ever. When I had the idea to turn all this into an artist’s book, I knew this book would be different compared to all books I had made so far. I had to plan this book far away from my studio. I’d then pack my suitcase and travel to my studio for a working visit limited in time. Once there, I’d print all sheets and cut to size all material needed. I’d fold and press the cover sheets. There would be no board shear, no block cutter no bookbinding presses available to me after I had left heading home again. All machinery would be some 500 kilometres away. I packed a box with the hand tools I’d need: awl and needles, thread and bonefolder. Thus this book is special in more than one aspect. 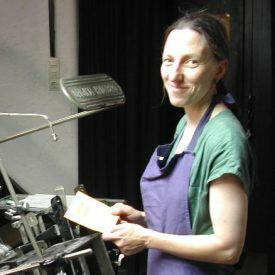 It is the last artist’s book I printed in the old place. But it is not made entirely there. I took the printed and folded sheets to finish them off away from the studio. I worked on a makeshift workplace. This book is not just about the meaning of the term away. 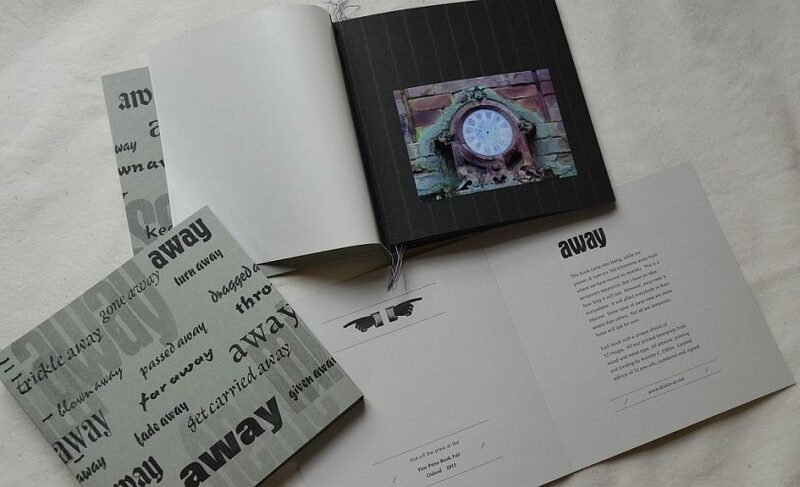 It is made in different stages of being away, part of the book’s substance is awayness. It is built upon, has taken shape within awayness. It breathes awayness. The book itself is an edition of twelve one-offs. Each of the books comes with a unique compilation of twelve photographs depicting a scene of awayness. The text passages are taken from various dictionaries. All books are hand sewn as coptic bindings. The cover is printed on grey Gmund Bee paper. The pages are fitted with glassine sheets to protect the photographs. The book was presented to the public at the Fine Press Book Fair in Oxford in autumn 2015. Only weeks before the fair was to open the fair’s manager Toby English passed away.